In Scotland, 321 acres and the ruins of Yester Castle have hit the market for offers over £450,000. 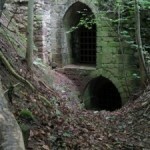 The ruins date back to before 1267 and the only remaining structure is the subterranean Goblin Ha’ or Hobgoblin Ha’ (Goblin Hall). According to legend, the castle was built by Sir Hugo de Giffard, a wizard and necromancer. Old Hugo decided to build a castle and made a pact with the devil in exchange for an army of hobgoblins who helped build it.